An authority on local, sustainable food systems and seasonal cooking, Sun Basket Executive Chef Justine Kelly boasts more than three decades in professional kitchens working alongside the best Bay Area chefs and California organic growers. Best known for her long standing role as the corporate chef de cuisine at San Francisco’s iconic restaurant, The Slanted Door, she has also made appearances on Iron Chef and the Williams-Sonoma Tasting Table Sous Chef Series. Follow Sun Basket on Facebook and Instagram. 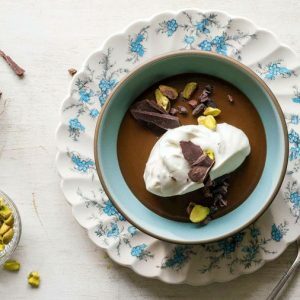 The avo-choco combo in this dessert makes for an exceptionally smooth pudding. The spice is optional, but eating the whole bowl may not be….Enjoy!